If you are like me, I am always looking for ways to spare some calories during the holiday season as to prepare for all of the yummy once-a- year food that I prepare for my guests. Those dishes are often filled with the holy trinity of the holiday season- sugar, salt and butter! By having a colorful salad on hand in your fridge, you can balance the calories of other heavy meals. 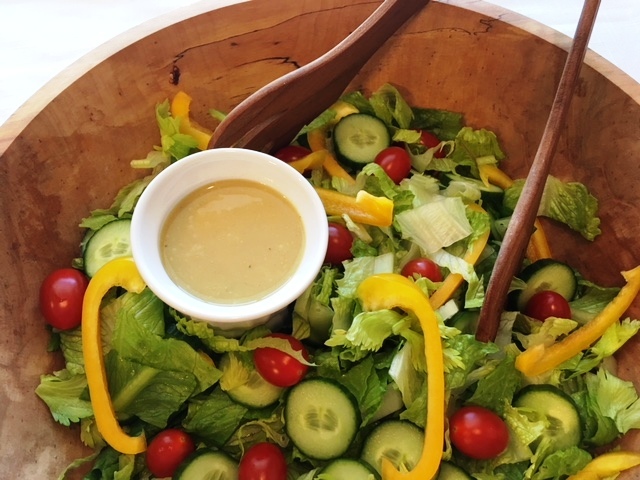 This salad dressing recipe is full of flavor and contains no oil, gluten, sugar or fat. Whip this up and store in your fridge to help combat those holiday pounds! Top your colorful salad with diced ham for complimentary flavor and added protein. Blend well using a blender or emulsifier. Can be served immediately or refrigerate for extra flavor!